To Cite: Heydari M, Ghorbian S, Sayyah Melli M . The Catechol-Methyltransferase rs4680 G>A Polymorphism is Associated with Uterine Leiomyoma Susceptibility, Gene Cell Tissue. 2019 ; 6(1):e86258. doi: 10.5812/gct.86258. Background: Uterine leiomyoma (ULM) is one of the most common medical conditions where the molecular pathogenesis in women in still unknown. Objectives: The aim of the present investigation was to demonstrate the association between catechol-methyltransferase (COMT) (rs4680 G>A) gene polymorphism with the risk of ULM. Methods: In the present case-control study we included 200 peripheral blood samples of women, which consisted of 100 women with ULM and 100 women who were healthy. The genotype frequencies were assessed using polymerase chain reaction - restriction fragment length polymorphism (PCR-RFLP) method. Results: The genotype frequencies of COMT (rs4680) gene polymorphism AA + GG vs. GA revealed a significant association with the risk of ULM (OR = 2.453; CI = 1.274 - 4.723, P = 0.006). Conclusions: The findings suggested that the COMT (rs4680) gene polymorphism may be contributed as a predisposing risk factor to ULM. ULM is one of the most common type of tumor; it originates from smooth muscle cells, is considered as a gynecological benign tumor, and affects 20% - 50% of women at fertility ages. ULM prevalence rates in black women are higher than in white women (1, 2). Although the molecular pathogenesis of ULM remained unknown, it has reported that the genetic and environmental factors contributed to ULM (3). Previous investigations have reported that several candidate gene polymorphisms, such as estrogen receptor alpha (ERα), cytochromes P450 (CYP), COMT, androgen receptor, and interleukin (IL) could have an impact on ULM susceptibility (4-10). COMT enzymes play roles in degradation of catecholamines, including dopamine, epinephrine, and norepinephrine. In humans, COMT enzyme was encoded by the COMT gene (11), which plays as a transfer from the methyl group to the carboxyl catechol estrogen group (10). COMT enzyme contributed as an inactivator of catecholamine neurotransmitters (dopamine, epinephrine, and norepinephrine). Levodopa is a precursor of catecholamines, which is an important substrate of COMT (12). A functional single-nucleotide polymorphism (rs4680 G>A) of the COMT gene leads to changing a valine to methionine amino acid (13). The enzyme with valine amino acid is notably active compared to the enzyme-containing methionine (14). However, the methionine variant upregulated in the brain leads to a 40% decrease in the enzyme activity (15). In regards to the preferential role of COMT in the prefrontal dopamine degradation, the Val158Met variant may have an impact on cognition by modulating the dopamine signaling pathway (16, 17). The COMT regulation activity may play a pathogenesis role in estrogen-induced tumorigenesis such as ULM. Due to discrepancies on the results reported to the significant roles of COMT (rs4680) gene polymorphism with the risk of ULM, we aimed to survey the frequency of COMT (rs4680 G>A) gene polymorphism with the risk of ULM. Our study was conducted in a case-control investigation, which comprised of 100 peripheral blood samples of female patients with ULM and 100 peripheral blood samples of healthy women who were referred to the department of infertility and sterility of Tabriz Al-Zahra hospital during 2015 - 2017. The inclusion criteria for the patients in the ULM group were those who underwent elective surgery such as laparoscopic myomectomy, open myomectomy, transcervical resection of the myoma, or hysterectomy. The inclusion criteria for the control group were lack of uterine fibroids after clinical and ultrasonographic evaluation as well as no family history of uterine leiomyoma. The control subjects matched for age, race (Turk), and geographic area with the ULM patients. The survey protocol was confirmed by the Ethics Committee of Tabriz Al-Zahra hospital and written informed consent was collected from all participants. Genomic DNA was obtained from 2 mL peripheral blood samples, with EDTA as an anti-coagulant, by the salting-out method (18). The primers and restriction enzyme were used for the gene sequence (accession number: NC_000022.11) listed in Table 1 (19). To evaluate the quantity and quality of extracted genomic DNA, we used NanoDrop (Thermo Scientific™. UAS) and 1% agarose gel electrophoresis, respectively. To determined genotype frequencies of COMT (rs4680) polymorphism, we used the PCR-RFLP method. The following conditions applied to amplify the region of involved SNP: 2 μL (100 ng) genomic DNA, 1 μL (10 picomoles) forward and reverse primers, 15 μL of Master Mix Red 2x (Ampliqon, Denmark), and 7 μL of distilled water. Amplification steps included a first denaturation at 95°C for 10 minutes, then at 35 rounds with a temperature of 95°C for 30 seconds, an annealing temperature of 59°C for 50 seconds, and a temperature of 72°C for 60 seconds. Final amplification was performed at 72°C for five minutes. 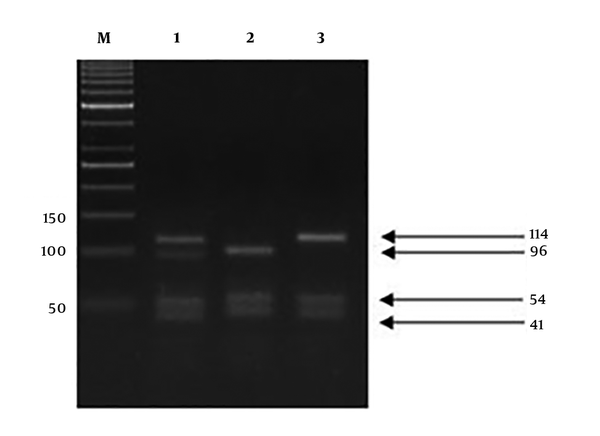 Before the enzyme digestion, the amplified products run on a 1% agarose gel electrophoresis and are stained with Safe Stain (Sina genes, Iran) to obtain amplification assurance. Digest was performed using restriction enzymes NIaIII (Fermentas, Germany), according to the manufacturer's protocol, which consisted of 10 μL of PCR-amplified products, 2 μL of Buffer 10x, 1 μL (1 unit/μL) enzyme, and 17 μL of distilled water, which were then mixed and incubated at 37°C for 12 hours. The digested PCR product was incubated for five minutes at 80°C for enzyme inactivation. Then, in order to evaluate the enzymatic digestion process, the amplified products electrophoresis on a 4% agarose gel and illuminated by the safe stain. The digested fragments were obtained for GG genotype (114 bp, 54 bp, 41 bp, 27 bp), for GA genotype (114 bp, 96 bp, 54 bp, 41 bp, 18bp, 27 bp), and AA genotype (96 bp, 54 bp, 41 bp, 18 bp, 27 bp) (Figure 1). To determine the different genotype and allele frequencies between ULM cases and control groups, the chi-square test was used. Odds ratios (OR) and 95% confidence intervals (CI) were done to evaluate the strength of correlation between genotypes and ULM. Two-tailed P values < 0.05 were considered statistically significant. The results were analyzed by SPSS software version 25. The case group comprised of 100 females with ULM (mean age 37.92 ± 4/722 years) and 100 healthy females without leiomyoma (mean age 37.27 ± 5.82 years). No significant difference in the mean age of groups was observed (P = 0.695). The genotype frequencies of COMT showed that GG, GA, and AA was 46, 35, and 19 in patients with ULM and 55, 18, and 27 in healthy women, respectively (Table 2). Our findings revealed a statistically significant difference between both groups (P = 0.022) (Table 2). In addition, we assessed a significant difference of genotype frequencies in different genetic models. The AA + GG vs. GA genetic model showed a statistically significant difference between groups (OR = 2.453; CI = 1.4 - 274/723, P = 0.006). Our results revealed that the COMT (rs4680) variation was associated with the risk of ULM. However, in dominant and recessive models, a statistically significant difference between two groups was not shown (Table 3). a Analysis by chi-square test. The study was aimed to find out if COMT (rs4680) gene polymorphism was associated with the risk of ULM in the women of Tabriz. Our results showed that the COMT (rs4680) gene polymorphism increased the risk of ULM. The ULM may develop from the cervix and form a lump or swelling in the stomach. Its precision molecular pathogenesis of ULM remained unknown, however, several surveys have found that it arises from smooth muscle cells. Of note, ULM has a low potential to the malignancy (20). Previous investigations showed that regulation of COMT activity may be modulating the biologic impact of estrogen and plays a critical role in leiomyoma formation (21, 22). In addition, the preliminary investigations have revealed that whole polymorphisms are not associated with a certain disease, however, they are a useful marker for predicting the susceptibility to multifactorial disorders, including leiomyoma of the uterus. The polymorphisms, which occurred in the regulatory or structural regions, may influence the genes expression levels and is also associated with the immunological reactions (23, 24). Previous investigations revealed that both genetic and environmental factors are associated with the development of ULM. The associations between COMT (rs4680) gene polymorphism, with the risk of ULM, have been considered in different ethnic communities with conflicting results. Morikawa et al. (25) showed that COMT (rs4680) gene polymorphism does not refer to be associated with ULM in the Japanese population (25). Denschlag et al. (26) did not reveal statistically significant differences in allele and genotype frequencies in Caucasian women (26). Gooden et al. (27) reported that the COMT (rs4680) variant was not associated with the risk of fibroids between African-American or white women (27). Similar to previous findings, de Oliveira et al. (28) reported no significant association between COMT (rs4680) genotypes/ alleles and ULM in Brazilian white/non-white women (28). According to the above surveys and the study of Ates et al. (12) regarding Turkish women with ULM, COMT (rs4680) polymorphism was not associated with an increased risk of ULM (12). These findings are contradictory to our investigation. Al-Hendy and Salama indicated that COMT Val/ Val genotype was associated with the risk of ULM (29). These discrepancies may be influenced by several parameters including differences between the patient's groups studied and the fibroid size of selected patients in different studies. Different geographic regions, race, ethnicity, and genetics or error analysis may lead to controversial results. In addition, the samples selection criteria may lead to controversy results. Low activity of COMT has been considered a risk factor for breast cancer (30), endometrial cancer (31), endometriosis, and adenomyosis (32). COMT change catechol estrogens, 2-hydroxyestradiol, and 4-hydroxyestradiol into inactive metabolites, which leads to stimulating uterine growth (33). Increased function of 4-hydroxycstradiol was demonstrated in the human ULM compared with the uterine myometrium (34). 2-methoxy estradiol inhibits DNA and collagen synthesis as well as apoptotic cell death. During decreasing activity of COMT enzyme, the 4-hydroxycstradiol levels was up-regulated and down-regulated 2-methoxyestradiol, induced cell propagation, reduced DNA synthesis, and inhibited apoptotic cell death in leiomyomas (25). It has been hypothesized that the COMT 158 Met allele may be a risk factor for the development of large fibroids (28). Alternatively, this controversial result could be due to heterogeneity between populations and the small number of samples used in the studies. In addition, other environmental factors should be considered in different geographic areas due to the interaction between gene and environmental factors (35). However, to confirm our findings more investigations in the future are needed. In conclusion, the genotypes frequency of COMT (rs4680) gene polymorphism AA + GG vs. GA revealed a significant association with the risk of ULM. The findings suggested that COMT (rs4680) gene polymorphism may be contributed as a predisposing risk factor to ULM. We would also like to thank all the participants for their contribution. This study was a dissertation for receiving an MS.c (IR: 941001) degree in Genetics. Authors' Contribution: All authors had an equal role in design, work, statistical analysis, and manuscript writing. Conflict of Interests: The authors have no conflict of interests. Ethical Considerations: All women studied signed a consent form in accordance with the ethical standards of the Institutional and/or National Research Committee and with the 1964 Helsinki Declaration as well as its later amendments or comparable ethical standards. The survey protocol was confirmed by the Ethics Committee of Tabriz Al-Zahra Hospital and written informed consent was collected from the participants. Funding/Support: This research received no specific grant from any public or commercial funding agency. 1. Virchow R. Ueber makroglossie und pathologische neubildung quergestreifter muskelfasern. Archiv für pathologische anatomie und physiologie und für klinische medicin. 1854;7(1):126-38. German. doi: 10.1007/bf01936233. 2. Ali M, Chaudhry ZT, Al-Hendy A. Successes and failures of uterine leiomyoma drug discovery. Expert Opin Drug Discov. 2018;13(2):169-77. doi: 10.1080/17460441.2018.1417381. [PubMed: 29254389]. 3. Francis JH, Kleinerman RA, Seddon JM, Abramson DH. Increased risk of secondary uterine leiomyosarcoma in hereditary retinoblastoma. Gynecol Oncol. 2012;124(2):254-9. doi: 10.1016/j.ygyno.2011.10.019. [PubMed: 22027510]. [PubMed Central: PMC3264733]. 4. Tuncal A, Aydin HH, Askar N, Ozkaya AB, Ergenoglu AM, Yeniel AO, et al. Increased expression of electron transport chain genes in uterine leiomyoma. Ann Clin Lab Sci. 2014;44(4):466-8. [PubMed: 25361934]. 5. Wang F, Chen J, Wang L, Ma Y, Mayinuer N. CYP1A1 genetic polymorphisms and uterine leiomyoma risk: A meta-analysis. Int J Clin Exp Med. 2015;8(3):3590-4. [PubMed: 26064254]. [PubMed Central: PMC4443088]. 6. Feng Y, Zhao X, Zhou C, Yang L, Liu Y, Bian C, et al. The associations between the Val158Met in the catechol-O-methyltransferase (COMT) gene and the risk of uterine leiomyoma (ULM). Gene. 2013;529(2):296-9. doi: 10.1016/j.gene.2013.07.019. [PubMed: 23939469]. 7. Inoue S, Mizushima T, Miyamoto H. Role of the androgen receptor in urothelial cancer. Mol Cell Endocrinol. 2018;465:73-81. doi: 10.1016/j.mce.2017.06.021. [PubMed: 28652170]. 8. Taghizade Mortezaee F, Hashemzadeh Chaleshtori M, Kheiri S, Farrokhi E, Shariati L, Tabatabaiefar MA, et al. Interleukin-1 B gene polymorphisms in Iranian patients with uterine fibroid, a case- control study. Biosci Biot Res Asia. 2015;12(1):341-5. doi: 10.13005/bbra/1671. 9. Mostafavi SS, Ebrahimi A, Sadat SM, Davari Tanha F, Aghasadeghi MR, Bahramali G, et al. Impact of null genotypes of GSTT1 and GSTM1 with uterine leiomyoma risk in Iranian population. J Obstet Gynaecol Res. 2016;42(4):434-9. doi: 10.1111/jog.12924. [PubMed: 26785830]. 10. Kotula-Balak M, Milon A, Pawlicki P, Opydo-Chanek M, Pacwa A, Lesniak K, et al. Insights into the role of estrogen-related receptors alpha, beta and gamma in tumor Leydig cells. Tissue Cell. 2018;52:78-91. doi: 10.1016/j.tice.2018.04.003. [PubMed: 29857832]. 11. Grossman MH, Emanuel BS, Budarf ML. Chromosomal mapping of the human catechol-O-methyltransferase gene to 22q11.1----q11.2. Genomics. 1992;12(4):822-5. doi: 10.1016/0888-7543(92)90316-K. [PubMed: 1572656]. 12. Ates O, Demirturk F, Toprak M, Sezer S. Polymorphism of catechol-o-methyltransferase and uterine leiomyoma. Mol Cell Biochem. 2013;375(1-2):179-83. doi: 10.1007/s11010-012-1540-3. [PubMed: 23238870]. 13. Lotta T, Vidgren J, Tilgmann C, Ulmanen I, Melen K, Julkunen I, et al. Kinetics of human soluble and membrane-bound catechol O-methyltransferase: A revised mechanism and description of the thermolabile variant of the enzyme. Biochemistry. 1995;34(13):4202-10. doi: 10.1021/bi00013a008. [PubMed: 7703232]. 14. Lachman HM, Morrow B, Shprintzen R, Veit S, Parsia SS, Faedda G, et al. Association of codon 108/158 catechol-O-methyltransferase gene polymorphism with the psychiatric manifestations of velo-cardio-facial syndrome. Am J Med Genet. 1996;67(5):468-72. doi: 10.1002/(SICI)1096-8628(19960920)67:5<468::AID-AJMG5>3.0.CO;2-G. [PubMed: 8886163]. 15. Zhu G, Lipsky RH, Xu K, Ali S, Hyde T, Kleinman J, et al. Differential expression of human COMT alleles in brain and lymphoblasts detected by RT-coupled 5' nuclease assay. Psychopharmacology (Berl). 2004;177(1-2):178-84. doi: 10.1007/s00213-004-1938-z. [PubMed: 15290009]. 16. Bruder GE, Keilp JG, Xu H, Shikhman M, Schori E, Gorman JM, et al. Catechol-O-methyltransferase (COMT) genotypes and working memory: Associations with differing cognitive operations. Biol Psychiatry. 2005;58(11):901-7. doi: 10.1016/j.biopsych.2005.05.010. [PubMed: 16043133]. 17. Diamond A, Briand L, Fossella J, Gehlbach L. Genetic and neurochemical modulation of prefrontal cognitive functions in children. Am J Psychiatry. 2004;161(1):125-32. doi: 10.1176/appi.ajp.161.1.125. [PubMed: 14702260]. 18. Miller SA, Dykes DD, Polesky HF. A simple salting out procedure for extracting DNA from human nucleated cells. Nucleic Acids Res. 1988;16(3):1215. doi: 10.1093/nar/16.3.1215. [PubMed: 3344216]. [PubMed Central: PMC334765]. 19. Lavigne JA, Helzlsouer KJ, Huang HY, Strickland PT, Bell DA, Selmin O, et al. An association between the allele coding for a low activity variant of catechol-O-methyltransferase and the risk for breast cancer. Cancer Res. 1997;57(24):5493-7. [PubMed: 9407957]. 20. Ando T, Kato H, Furui T, Morishige KI, Goshima S, Matsuo M. Uterine smooth muscle tumours with hyperintense area on T1 weighted images: Differentiation between leiomyosarcomas and leiomyomas. Br J Radiol. 2018;91(1084):20170767. doi: 10.1259/bjr.20170767. [PubMed: 29308922]. [PubMed Central: PMC5966007]. 21. Dzhemlikhanova LK, Efimova OA, Osinovskaya NS, Parfenyev SE, Niauri DA, Sultanov IY, et al. Catechol-O-methyltransferase Val158Met polymorphism is associated with increased risk of multiple uterine leiomyomas either positive or negative for MED12 exon 2 mutations. J Clin Pathol. 2017;70(3):233-6. doi: 10.1136/jclinpath-2016-203976. [PubMed: 27491313]. 22. Commandeur AE, Styer AK, Teixeira JM. Epidemiological and genetic clues for molecular mechanisms involved in uterine leiomyoma development and growth. Hum Reprod Update. 2015;21(5):593-615. doi: 10.1093/humupd/dmv030. [PubMed: 26141720]. [PubMed Central: PMC4533663]. 23. Pietrowski D, Thewes R, Sator M, Denschlag D, Keck C, Tempfer C. Uterine leiomyoma is associated with a polymorphism in the interleukin 1-beta gene. Am J Reprod Immunol. 2009;62(2):112-7. doi: 10.1111/j.1600-0897.2009.00718.x. [PubMed: 19614627]. 24. Hsieh YY, Chang CC, Tsai CH, Lin CC, Tsai FJ. Interleukin (IL)-12 receptor beta1 codon 378 G homozygote and allele, but not IL-1 (beta-511 promoter, 3953 exon 5, receptor antagonist), IL-2 114, IL-4-590 intron 3, IL-8 3'-UTR 2767, and IL-18 105, are associated with higher susceptibility to leiomyoma. Fertil Steril. 2007;87(4):886-95. doi: 10.1016/j.fertnstert.2006.07.1541. [PubMed: 17222831]. 25. Morikawa J, Yoshida S, Kennedy S, Takemura N, Sugimoto M, Kitao K, et al. Association study between catechol-O-methyltransferase polymorphisms and uterine leiomyomas in a Japanese population. Clin Exp Obstet Gynecol. 2008;35(1):35-40. [PubMed: 18390078]. 26. Denschlag D, Bentz EK, Hefler L, Pietrowski D, Zeillinger R, Tempfer C, et al. Genotype distribution of estrogen receptor-alpha, catechol-O-methyltransferase, and cytochrome P450 17 gene polymorphisms in Caucasian women with uterine leiomyomas. Fertil Steril. 2006;85(2):462-7. doi: 10.1016/j.fertnstert.2005.07.1308. [PubMed: 16595228]. 27. Gooden KM, Schroeder JC, North KE, Gammon MD, Hartmann KE, Taylor J, et al. Val153Met polymorphism of catechol-O-methyltransferase and prevalence of uterine leiomyomata. Reprod Sci. 2007;14(2):117-20. doi: 10.1177/1933719106298687. [PubMed: 17636223]. 28. de Oliveira E, de Aquino Castro R, Gomes MT, da Silva ID, Baracat EC, de Lima GR, et al. The catechol-O-methyltransferase (COMT) gene polymorphism and prevalence of uterine fibroids. Maturitas. 2008;60(3-4):235-8. doi: 10.1016/j.maturitas.2008.07.001. [PubMed: 18752908]. 29. Al-Hendy A, Salama SA. Catechol-O-methyltransferase polymorphism is associated with increased uterine leiomyoma risk in different ethnic groups. J Soc Gynecol Investig. 2006;13(2):136-44. doi: 10.1016/j.jsgi.2005.10.007. [PubMed: 16443508]. 30. Huang CS, Chern HD, Chang KJ, Cheng CW, Hsu SM, Shen CY. Breast cancer risk associated with genotype polymorphism of the estrogen-metabolizing genes CYP17, CYP1A1, and COMT: A multigenic study on cancer susceptibility. Cancer Res. 1999;59(19):4870-5. [PubMed: 10519398]. 31. Zhao XM, Xie MQ, Yang DZ, Wang LA, Li SJ, Zhuang YY, et al. [Polymorphism of catechol-O-methyltransferase gene in relation to the risk of endometrial cancer]. Zhonghua Fu Chan Ke Za Zhi. 2007;42(2):116-9. Chinese. [PubMed: 17442187]. 32. Juo SH, Wang TN, Lee JN, Wu MT, Long CY, Tsai EM. CYP17, CYP1A1 and COMT polymorphisms and the risk of adenomyosis and endometriosis in Taiwanese women. Hum Reprod. 2006;21(6):1498-502. doi: 10.1093/humrep/del033. [PubMed: 16527884]. 33. Zhu BT, Conney AH. Functional role of estrogen metabolism in target cells: Review and perspectives. Carcinogenesis. 1998;19(1):1-27. doi: 10.1093/carcin/19.1.1. [PubMed: 9472688]. 34. Liehr JG, Ricci MJ, Jefcoate CR, Hannigan EV, Hokanson JA, Zhu BT. 4-Hydroxylation of estradiol by human uterine myometrium and myoma microsomes: Implications for the mechanism of uterine tumorigenesis. Proc Natl Acad Sci U S A. 1995;92(20):9220-4. doi: 10.1073/pnas.92.20.9220. [PubMed: 7568105]. [PubMed Central: PMC40956]. 35. Ye Y, Cheng X, Luo HB, Liu L, Li YB, Hou YP. CYP1A1 and CYP1B1 genetic polymorphisms and uterine leiomyoma risk in Chinese women. J Assist Reprod Genet. 2008;25(8):389-94. doi: 10.1007/s10815-008-9246-x. [PubMed: 18763031]. [PubMed Central: PMC2582125].